The German colony of Rwanda fell under Belgian control after World War I and became independent in 1962. But this small country in Central Africa had the sort of tribal tensions that dogged many newly freed African nations. Two main tribal groupings lived in this verdant area, which also encompassed neighboring Burundi. Hutus were in the majority, with Tutsis forming an elite minority. After independence, Hutus took power in Rwanda and supported fellow Hutus in opposing Burundi’s minority Tutsi government, whose army orchestrated genocidal retribution after a Hutu rebellion in 1972. When a Hutu president was elected in Burundi’s first democratic elections in 1993 and assassinated by the Tutsi-dominated army, civil war erupted. Meanwhile, inter-tribal conflict was also raging in Rwanda, after the Tutsi-dominated Rwandan Patriotic Front (RPF) invaded from Uganda in 1990. On April 6 1993 Burundi’s replacement Hutu President, Cyprien Ntaiyamira, was flying into Rwanda in company with Rwandan J President Juvenal Habyarimana during yet another attempt to broker a peace deal between warring factions in both countries. But their plane was shot down on the approach to Rwanda’s capital of Kigali, killing all aboard. Blaming Tutsis for the assassination, members of the Hutu Interahamwe (‘Those who stand together’)- and Impuzamugambi (‘Those with a single goal’) paramilitary organizations began the indiscriminate murder of Tutsis and moderate Hutus. Mass genocide continued unabated for four months as neighbor fell upon neighbor with violent savagery. 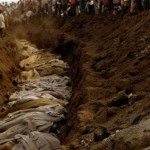 The world watched in horror – and ineffectually protested – as the ongoing genocide was directed by an influential Hutu group known as the Akazu made up of the dead President Habyarimana’s inner circle. It continued alongside a renewed civil war until the Tutsi RPF emerged triumphant, thus ending the genocide and causing two million Hutus to flee from Rwanda to neighboring countries in anticipation of Tutsi revenge. You should know: Following the RPF”s victory a government erf national unity was established in Rwanda, which prohibited any discrimination on the basis of ethnicity, race or religion and now bans any emphasis on Hutu or Tutsi identity in any part of the political process. But the work of reconstruction and reconciliation has been slow. The disparate communities of Iraq — majority Shi’ites, Sunnis and Kurds – were ruled with an iron hand by President Saddam Hussein, who came to power after deposing his Arab Socialist Ba’ath Party leader and friend Ahmed Hasan Al-Bakr in 1979. Indicating his future modus operandi as a supreme human rights abuser, all potential rivals for the top job were arrested, murdered… or both. In classic dictatorship style Saddam Hussein then attempted to defuse internal tension by declaring a patriotic war on an external ‘enemy’ – the new Shi’ite-led Iranian regime. Hostilities lasted from 1980 to 1988, cost up to 1.5 million lives and ended in a bloody and indecisive stalemate. Meanwhile, the troublesome Kurds of northern Iraq posed a problem for Saddam’s regime. This proud and would-be-independent people favored the Iranian cause as the lesser of two evils, so Kurds and Iranians had combined to resist government forces that unleashed Operation Anfal in 1986 to terrorize and subjugate a Kurdish rural population that harbored insurgents. The operation was led by Saddam’s feared cousin Ali Hassan al-Majid. Chemical Ali was his nickname, earned after deadly chemical warfare became his game. This was acquired after a ruthless poison gas attack on the town of Halabja, which had been liberated during the closing months of the Iraq-Iran conflict by Kurdish peshmerga guerrillas. Saddam Hussein couldn’t afford to lose the Anfal campaign, and ordered al-Majid to use air-dropped mustard gas and the nerve agents sarin, tabun and VX on Halabja and surrounding villages, backed by a conventional offensive intended to crush the Kurdish revolt once and for all. Thousands died immediately, mostly civilians, and thousands more would suffer long-term health problems as a result of the chemical attack. 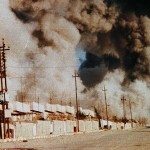 Subsequently Halabja itself was virtually destroyed by bombing and a ground attack. Death toll: The world’s largest chemical weapons attack on a civilian population is thought to have killed up to 5,000 people and certainly no fewer than 3,500, with over 7,000 more injured out of a population of 80,000. You should know: Ali Hassan al-Majid, Saddam Hussein’s cousin and the infamous instrument of the dictator’s repressive regime, was captured when Coalition forces invaded Iraq in 2003 and in 2007 was sentenced to death for crimes against humanity, war crimes and genocide. The world might have remained supremely indifferent to famine that took Ethiopia in its iron grip during 1984. But late that year a BBC crew documented the rapidly intensifying disaster with reporter Michael Buerk using evocative phrases like ‘the closest thing to hell on earth’ and ‘a biblical famine in the 20th century’. Graphic reports and harrowing pictures of starving children galvanized British and, as the publicity bandwagon rolled, worldwide public opinion. Rock stars Bob Geldof and Midge Ure wrote a charity song entitled Do They Know It’s Christmas?, assembled a group named Band Aid and released the record to support Ethiopian famine relief. It went to Number One, selling 3.5 million copies in Britain alone. 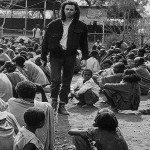 Mightily encouraged, Geldof organized Live Aid in July 1985, when simultaneous pop concerts in London and Philadelphia raised a vast sum for Ethiopian famine relief. Had it not been for this magnificent effort – and equally significant official interventions such as food drops by governments spurred into action by newly aroused public awareness – the famine could have been every bit as serious as the great Ethiopian famine that killed 3.5 million people a century before. Even so, the country saw a serious humanitarian disaster unfold before the famine ended in 1988. The Ethiopian government was interested only in fighting insurgencies in the north (by the Tigrayan People’s Liberation Front) and south (Oromo Liberation Front), while continuing friction was caused by the troubled federation with Eritrea. Half of all national resources were devoted to military spending, even as low rainfall caused a succession of poor harvests. This imbalance ensured that no efforts were made to prepare for the impending famine, while medical provision was run right down. It was a recipe for prolonged suffering that would cost innumerable lives and see millions of Ethiopians become displaced and destitute. Death toll: Despite the best efforts of relief agencies and donor governments, the famine still resulted in an estimated one million deaths, the majority in 1984 before it came to international attention. You should know: Live Aid concerts at Wembley Stadium in London and Philadelphia’s JFK stadium became one of the most widely watched live TV events ever staged, with an estimated audience of 400 million. The original intention was to raise £1 million through ticket safes, but when the final revenue total was calculated the figure was a staggering £150 million. Even so. Live Aid’s real triumph was in inflaming public opinion to a degree that governments simply couldn’t ignore, thus greatly enhancing the relief effort. Communism and Southeast Asia endured a stormy relationship after World War II, as China exported its political philosophy throughout the region. Both Americans and French discovered in Korea and Vietnam respectively how hard it was to roll back this seemingly inexorable tide, and Cambodia became independent in 1953 when French Indochina collapsed under the assault of Ho Chi Mirth’s Viet Minh communist army. This constitutional monarchy under Prince Sihanouk remained neutral during the Vietnam War, until Sihanouk was ousted in 1970 by an American-backed coup. Forced to seek refuge in Beijing, he became the figurehead for communist Khmer Rouge insurgents, whose cause was greatly aided when America bombed Cambodia in an attempt to suppress guerrilla activity. Cambodia’s civil war ended in 1975 when capital city Phnom Penh fell to Pol Pot’s Khmer Rouge. The new regime started destroying evidence of Western influence, emptying cities and force-marching the urban population into the countryside to engage in hopelessly inadequate agricultural projects. As starvation and disease set in, this policy alone would have created a significant humanitarian disaster. But the Khmer Rouge didn’t stop there. Minorities were persecuted and killed in large numbers and the biters were bitten – high on the hit list were ethnic Chinese. Other targets included Cham Muslims and anyone who could remotely be described as ‘intellectual’, a term that included everyone wearing spectacles. The infamous Tuol Sleng Prison became a center for mass murder and there were rural sites – chillingly nicknamed the Killing Fields – where countless others were executed. As hundreds of thousands of Cambodians fled into Thailand, the genocide intensified. 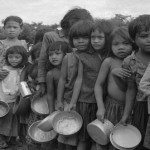 By November 1978, when Vietnam invaded and put an end to Khmer Rouge excesses, at least 1.25 million Cambodians had died from starvation or genocide out of a population of 7.5 million. The total was probably much greater. Death toll: Unknown. Estimates vary from 1.25 million to three million deaths directly caused by Khmer Rouge activities. You should know: in 1979, following the Khmer Rouge’s defeat at the hands of Vietnamese forces, the movement’s de facto leader Pol Pot fled into the jungles on Cambodia’s border with Thailand where he maintained the pretense of leading a legitimate government. He died aged 69 in 1998 while under house arrest, having fallen out with a Khmer Rouge faction led by his rival Ta Mok. It is rumored that Pol Pot was poisoned. The boundaries of African colonies seized by European countries in the 19th century were arbitrary, representing lines drawn on a map rather than reflecting territories occupied by subjugated peoples. This had the potential for almost limitless tribal conflict as former colonies were granted their freedom after World War II, for emergent nations often contained ethnic groups with traditional rivalries and the ensuing struggle for supremacy could be savage. This was clearly illustrated by Nigeria’s experience after independence in 1960. The new nation sought to combine groups divided by ethnicity and religion – a process leading to serious tensions that culminated in two military coups from which Northerners emerged triumphant. When the Northern coup resulted in the murder of military and civilian members of the Igbo (or Ibo) people in 1967, they declared their homeland independent as the Republic of Biafra under the leadership of Lt Col Emeka Ojukwu. Despite recognition by some African states and tacit support from countries like France and Israel, the Nigerian FMG (Federal Military Government) wouldn’t allow the oil-rich eastern region to secede. In the increasingly vicious Nigeria-Biafra war that followed, Igbos fought gallantly but the FMG had infinitely superior forces and ruthlessly drove back the defenders. Appalling hardship ensued for the civilian population, with massacres reported as FMG forces advanced and famine took hold after the Nigerian government blockaded Biafra and banned Red Cross aid. As the world sat on its hands and ignored the developing humanitarian disaster, hundreds of thousands died of malnutrition before Biafran resistance was crushed in 1970. This dreadful tragedy did have one positive legacy. 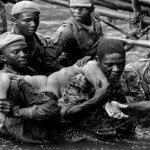 French doctor Bernard Kouchner was so moved by the fate of starving Biafrans – especially the legion of children – that he founded Medecins sans Frontieres. This developed into one of the world’s most effective aid agencies. Death toll: During the conflict more than one million people died in battle, through ethnic cleansing or (the vast majority) from starvation. You should know: The thriller writer Frederick Forsyth was a war reporter for the BBC during the conflict before leaving to become a freelance after showing alleged bias towards the Biafrans – one of many Europeans sympathetic to their cause. His first book was not the world-famous bestseller The Day of the Jackal but The Biafra story, published in 1969 to try and tell the world how grievously Biafran people were suffering. The failure of China’s Great Leap Forward strengthened the hands of moderates in the ruling Communist Party who favored a more centrally planned style of development. Seeing his position within the party threatened, Mao Zedong re-asserted his authority in 1966 by launching the Great Proletarian Cultural Revolution. An unrelenting barrage of propaganda presented this as nothing less than a move to reclaim the heart and soul of the nation, which Mao claimed had been contaminated by ‘revisionist’ elements and ‘bourgeois’ influences. History, however, enables us to see Mao’s initiative for what it truly was: a brazenly successful ploy to hold on to power which masqueraded as an exercise in revolutionary fervor. Mao’s principal shock troops in this program of ideological cleansing were the Red Guards, radical young activists recruited from secondary schools and universities who were blindly obedient to the Chairman’s every whim. Unleashed on the long-suffering Chinese population, which was still recovering from the Great Famine, these youthful zealots rampaged around the country, brandishing Mao’s Little Red Book of doctrinal exhortations while railing against the ‘Four Olds’ of thoughts, culture, customs and habits. Anyone in a position of authority was deemed suspect and liable to harassment, torture or even arbitrary execution. The more educated you were, the greater the danger; members of the intellectual and urban elite were dispatched to the countryside and forced to work in the fields and on construction projects. The behavior of Red Guard units soon led to chaos and civil unrest. After two years Mao had to call in the army to restore order, and thousands of Red Guards were sent to remote areas of the country to be re-educated’ among the peasantry. Death toll: There is still considerable denial in official circles regarding this episode in China’s history so accurate figures for casualties in the Cultural Revolution are hard to come by. Deaths – from random violence, purges and factional fighting – were almost certainly in the millions, possibly as high as 20 million. You should know: The Cultural Revolution lurched on, in a rather more restrained form, until 1976 when the death of Mao Zedong and the subsequent scapegoating of the Gang of Four (including Mao’s wife Jiang Qing), who were blamed for its mistakes, marked its eventual demise.